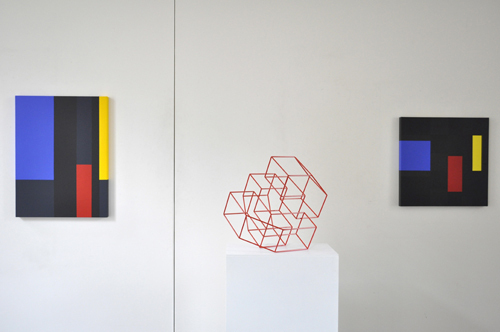 For this show we wanted to stress two fundamentally different approaches to geometric abstraction : calculated reasoning versus an empirical method in which the act transcends the idea. Charles Bézie and Isabelle de Gouyon Matignon conceive their works in very different ways. In the recent work of his that we’ll be showing, Bézie takes up a theme he already explored in the 1990s with his Orthogonals. At that time his palette was restricted to grays, blues and blacks, but now his “Orthos” have become more playful—color is back on the scene in the form of primary colors against a dominant backdrop of black. Notably in view is yellow, which had vanished for nearly thirty years since it first appeared in his “Primaries” series. 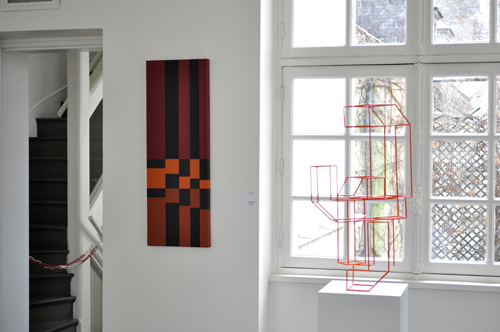 Bézie bases the construction of his paintings on numbers (such as the Fibonacci sequence and the golden mean), but also on right angles and primary colors. His works are therefore built and developed from a calculated sense of design. 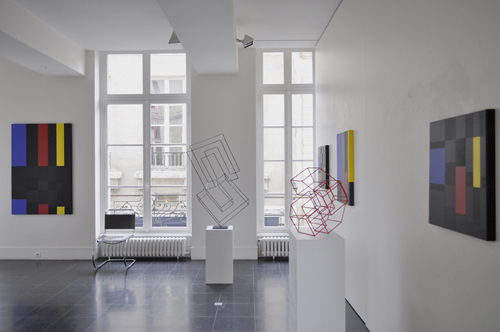 Still in the realm of geometry, if moving to the sphere of sculpture, Isabelle de Gouyon Matignon conceives her work in a radically different manner. Her sculptures appear to her in the form of visions, impressing themselves on her mind all at once. This obsessive presence obliges the artist to bring them to life in space, first through sketches on paper, then three-dimensionally in cardboard and finally in metal, either as solid shapes or simply as voids visible only in outline. 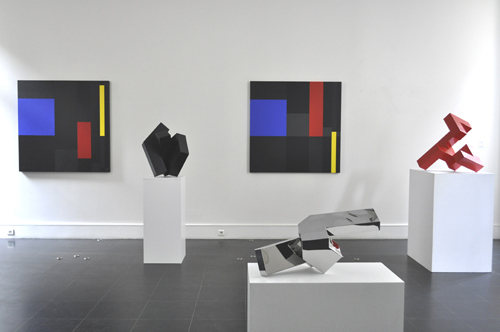 De Gouyon Matignon’s sculptures thus spring from an empirical approach, unlike works by Bézie. 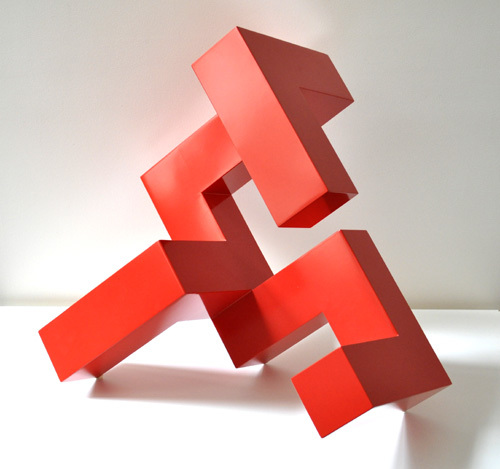 She deals with both solids and voids, and the positioning of her sculptures betrays an imbalance that renders them fragile : they totter, making their geometric construction uncertain, like a hesitant idea.